speaking of tow trucks at hagerstown....the one that rolled over while towing a car off the track was pretty strange and funny. probably late 90s early 2000s. 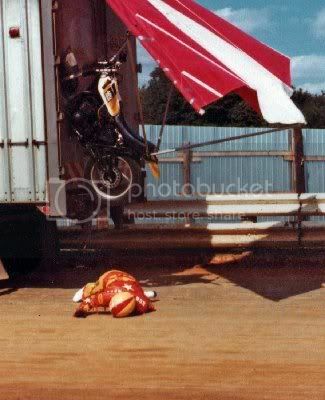 NEWBOMB TURK wrote: Another good one was when the guy with the kite cycle tried to jump over the bridge and a tractor trailer at the grove. He made it over the bridge but not the trailer. The cycle was stuck in the back of the trailer doors. The guy was pretty messed up but I think he lived. Still another good one was when Ed Spencer was late at coming out for a feature at Selinsgrove. He was told to go to the rear. He refused saying a push truck never came to push him out. He parked his car under the starters stand and refused to move it. While he was out of the car a push truck was called to push the car off. Ed was threatening the guy and he panic ed and pushed the car. It went across the track and crashed into the guardrail. Ed got ****** and ran after the truck and climbed into the bed. There just happened to be a 4x4 back there that Ed put to good use by smashing out the rear window. Not sure if the drive was injured, but the Pa State Police hauled Ed off and he was banned from the track for life. I was there for both of those incidents...Bob Correll was the kitecycle rider..
Water truck gettin taken out and stuffed into wall by pulled wheel packer. OMG pleeeese tell me someone has that on video. thought I was gonna pi$$ my pants watching from the infield. here's the "after-effects"
Last edited by graderfan on Wed Jun 29, 2011 12:21 pm, edited 1 time in total. Gotta agree with the Bitty one. Also when the 358s 1st started at Trailways there was a restart and the rope broke on the cone. The cars were entering turn 3 and the idiot decided to run out in the middle of track and try to get the cone with the cars coming at him full speed off of 4. The best part was the flagman never through the yellow. He just made to the apron of the track as the full field was going by. Thank God he didnt fall. One more for Trail-way. It rained at 1pm on raceday and they actually raced that night !! Now that is the strangest thing that has ever happened there. LOL The lightening storm approaching the track while the cars were at full speed in the feature and the power goes out and tracl becomes pitch black in an instant . not 1 car wrecked . That was amazing itself!! That was Ian Wray, who is originally from England. Might be a common occurance over there lol. Yeah, I remember that night also. Was certainly worth a laugh especially since the announcer was pointing it out while he was running back there! Great picture. Was there also. Newbomb is wrong. He didn't even come close to making it over the bridge. Bob Weikert was on his hauler & immediatley said all bets cancelled. Another incident was a sprint car being towed into the Lincoln infield pit area. It was a 2 wrecker deal & the first wrecker kept going as the 2nd wrecker stopped. Stretched the car between the 2 & we had sprint kabob. His wing was now ruined as the car rolled onto it's lid. A night that comes to mind for me was at Port Royal Speedway. I don't remember the exact year, but Todd Shaffer flipping through the tin in turn 1. I was standing down in turn 1 and it all seemed to go in slow motion. A few of us were the first ones there, and he had pulled himself out of the car and was laying on the ground catching his breathe. Best part was when he got up and was walking back towards the pit entrance, he turns and says, "Hey, do you think they're gonna make me pay for another pit pass?" hahaha classic! I remember that one, happened in the late 90's. I'm gonna guess '98. It may have been the same year he flipped in turn 2 at Port and suffered a concussion then raced the next night at Selinsgrove. Remember when port always had that dip that wobbled the cars going into turn 1? They always said it was due to the tunnel but the tunnel is still there and the dip has been gone for years now.